I hadn't assembled cardstock buildings since the 1960s! 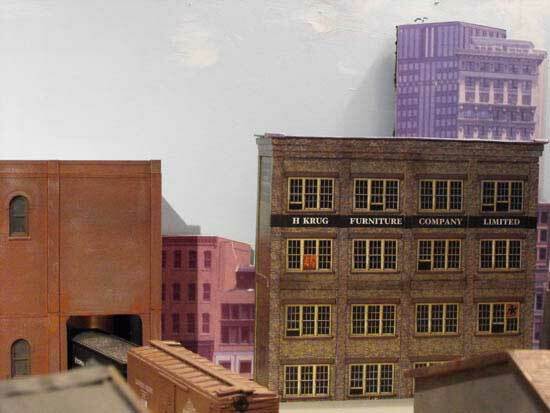 Cardstock was a primary modeling medium in the early years of the model railroading hobby and has largely been supplanted by wood and styrene.I was first introduced to cardstock buildings through Superquick kits and building papers from Britain. These kits were based on British style architecture and railway structures. I still have several I never built sitting in a drawer. At a local train show in 2010 I saw a display of cardstock buildings from an Ontario, Canada company called 3DK. These buildings and backdrop structures are based on North American prototypes. 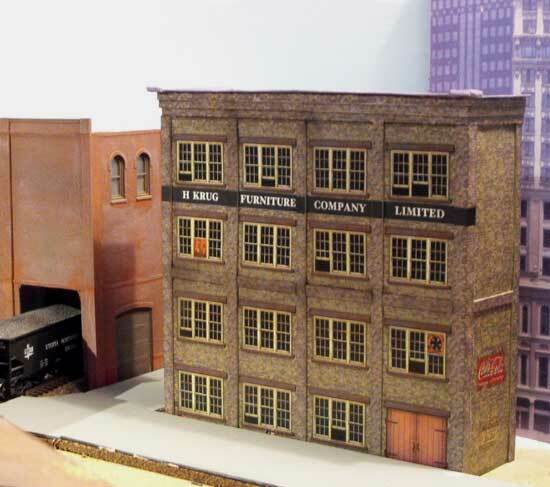 For example, the H Krug Furniture Factory shown above is based on a building that resided in Berlin, Ontario at the turn of the 20th century. The company manufactured office chairs, dining room and parlor furniture. Cardstock buildings are built up in layers. For example, the pilasters have a second piece of cardstock glued on top of the base layer. A brick-printed peel-and-stick paper is then applied on top of that. This provides three-dimensional relief to the walls. The manufacturer cautions the modeller to use a lot of new X-Acto or razor blades to cut out the pieces. Cardstock dulls blades quickly. I went through a dozen #11 blades. I used white glue and paper glue for assembly. I put weights on each sub assembly after gluing on pieces and gave them time to dry before continuing. This spread assembly of the building over two weeks. I found it better to break the job down into short work sessions instead of rushing. The 3DK instructions have photos of the sequence of steps and all the parts are well indentified so it's difficult to make a mistake. I used an NMRA steel ruler and a cutting mat when cutting out parts. It's important to cut carefully along the printed lines. After assembling the kit I applied a thin wash of black india ink and isopropyl alcohol and some black weathering chalk. 3DK also suggests a final spray of dullcoat after weathering the building. I'd forgotten how much fun it is to assemble cardstock buildings. I had ordered some of the backdrop kits from the 3DK website and only added the H Krug Furniture Factory as an afterthought figuring it might make a good addition in front of the backdrop I was contemplating. See the finished result for yourself. These cardstock buildings are an inexpensive alternative to wood and styrene structures, especially when used as backdrop elements. 3DK also makes a Procter & Gamble Soap Factory and some other railroad structures. It's nice to be able to model some North American railroad strucures in cardstock instead of British ones. Check out 3DK and try building a kit for your layout. Back in 2013 I had been working with some paper on cardstock and illustration board using template designs from Clever Models. Fellow NMRC club member, John Houghton, put me on to these. He has made up some of the buildings scaled to N scale for his own layout and some HO models to cover turnout machines and Tam Valley boards on our club layout. This is an inexpensive approach that is better than mockups and can look very good even relatively close up. I constructed some for the old NMR club layout. You see some of them if you go to the club page and look at some of the photos of the centre peninsula. That layout has now been dismantled and we are building a new layout at Bygone Days in Collingwood. Paper buildings will help us make a quick start to "fill in" the scenery while we build replicas of the actual buildings in Collingwood and on the line to Meaford. Go from "cardstock-buildings" to kit building overview. Return from "cardstock-buildings" to my Home Page.